Yesterday I finished up the quilt top for my friend's quilt. I have received a few questions as to the fabrics in the quilt. Some of you may remember this post. This is a memory quilt for that same friend. The fabrics are all from her husband's shirts. I actually researched ordering the batting wholesale (see #10 in my goal list, bottom left.) Did you know that cotton prices are going up this year? Probably pretty soon. You can read more about it here. Basically there is less cotton than what the world uses so you can bet all of our cotton products are going to go up in price. That means our hobby will become that much more expensive! Maybe those stash diets I've seen popping up over the New Year might not be such a bad idea. I started a fun little feature over on my left sidebar. My SIL has a "Reality Check" on her blog and I love reading it. So I decided to do my own version but it will only list the latest 7 things I add to the list. Mine is titled "The Nut Shell" because it's basically my life in a nut shell and sometimes I feel like a nut. Here you will catch glimpses of my very ordinary life as a mom of two, but as any of us with kids know life with kids can be anything but ordinary. Anyway, hug your loved ones because you never know what life will bring. A couple of months ago my daughter and I could have been in a terrible accident with a semi truck that ran a red light at 50mph. It was our turn to go, we were first in line. Luckily my Heavenly Father decided it wasn't our time and so we weren't in that intersection. It sure made me think about whether or not my family knows I love them each and every day. That is a lovely quilt. Such a sweet thing you are doing for your friend! The quilt is lovely. I do indeed remember the post. I am shocked that it has been that long. Time can fly indeed. Thanks for the link to the hymn. I love the "in a nutshell"
It's looking so beautiful. I've learned a couple things about the Hobby Lobby Coupon - you don't have to have a printed off one to get the discount. Just pull the image up on your phone and they will give it to you. Also, Hancocks will honor Hobby Lobby or Michaels or Joanns coupons, so if you get a 40% off for one, it will probably work at another store. 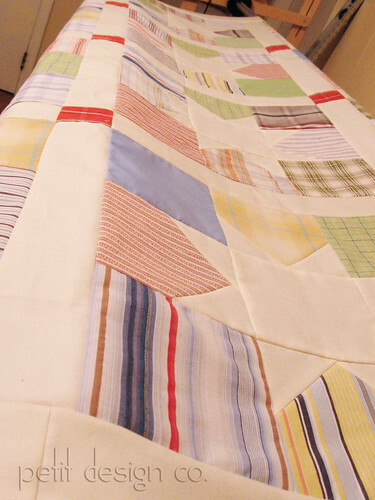 This is such a perfect quilt for the shirt fabrics. I love the quilt and the gesture. I've made a couple of quilts lately for people in need. It's been theraputic for me to actually DO something when I felt so helpless. I'm excited to see it when it's done.